Total nonfarm payroll employment increased by 148,000 in December, and the unemployment rate was unchanged at 4.1 percent, the U.S. Bureau of Labor Statistics reported today. Employment gains occurred in health care, construction, and manufacturing. In December, the unemployment rate was 4.1 percent for the third consecutive month. The number of unemployed persons, at 6.6 million, was essentially unchanged over the month. Among the major worker groups, the unemployment rate for teenagers declined to 13.6 percent in December, offsetting an increase in November. Total nonfarm payroll employment rose by 148,000 in December. Job gains occurred in health care, construction, and manufacturing. In 2017, payroll employment growth totaled 2.1 million, compared with a gain of 2.2 million in 2016. Employment in health care increased by 31,000 in December. Employment continued to trend up in ambulatory health care services (+15,000) and hospitals (+12,000). Health care added 300,000 jobs in 2017, compared with a gain of 379,000 jobs in 2016. Construction added 30,000 jobs in December, with most of the increase among specialty trade contractors (+24,000). In 2017, construction employment increased by 210,000, compared with a gain of 155,000 in 2016. 30-year fixed-rate mortgage (FRM) averaged 3.95 percent with an average 0.5 point for the week ending January 4, 2018, down from last week when it averaged 3.99 percent. A year ago at this time, the 30-year FRM averaged 4.20 percent. 15-year FRM this week averaged 3.38 percent with an average 0.5 point, down from last week when it averaged 3.44 percent. A year ago at this time, the 15-year FRM averaged 3.44 percent. 5-year Treasury-indexed hybrid adjustable-rate mortgage (ARM) averaged 3.45 percent this week with an average 0.4 point, down from last week when it averaged 3.47 percent. A year ago at this time, the 5-year ARM averaged 3.33 percent. 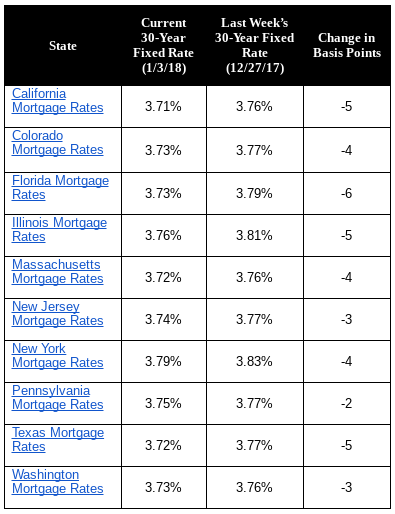 “Treasury yields fell from a week ago, helping to drive mortgage rates down to start the year,” said Freddie Mac’s deputy chief economist Len Kiefer. “The 30-year fixed-rate mortgage fell 4 basis points from a week ago to 3.95 percent in the year’s first survey. Despite increases in short-term interest rates, long-term interest rates remain subdued. 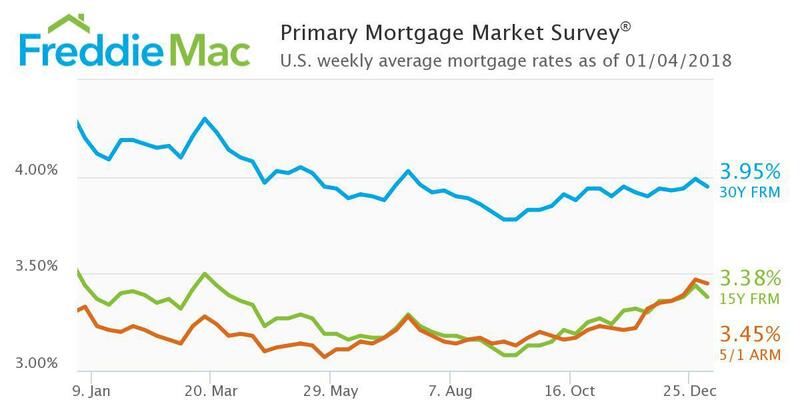 The 30-year fixed mortgage rate on Zillow Mortgages is currently 3.75 percent, down three basis points from this time last week. The 30-year fixed mortgage rate hovered around 3.80 percent for most of the last week before dipping to the current rate today. The rate for a 15-year fixed home loan is currently 3.15 percent, and the rate for a 5-1 adjustable-rate mortgage (ARM) is 3.33 percent. The rate for a jumbo 30-year fixed loan is 4.01 percent. “Mortgage rates were flat during the holiday-shortened week with markets very quiet between Christmas and New Year’s,” said Aaron Terrazas, senior economist at Zillow. The Market Composite Index, a measure of mortgage loan application volume, decreased 2.8 percent on a seasonally adjusted basis from two weeks earlier. On an unadjusted basis, the Index decreased 42 percent compared with two weeks ago. The Refinance Index decreased 7 percent from two weeks ago. The seasonally adjusted Purchase Index increased 1 percent from two weeks earlier. The unadjusted Purchase Index decreased 40 percent compared with two weeks ago and was 3 percent higher than the same week one year ago. The refinance share of mortgage activity increased to 52.0 percent of total applications from 51.8 percent the previous week. The adjustable-rate mortgage (ARM) share of activity decreased to 5.3 percent of total applications. The FHA share of total applications increased to 10.4 percent from 10.3 percent the week prior. The VA share of total applications increased to 11.2 percent from 10.6 percent the week prior. The USDA share of total applications increased to 0.8 percent from 0.7 percent the week prior. The average contract interest rate for 30-year fixed-rate mortgages with conforming loan balances ($424,100 or less) remained unchanged from the week prior at 4.25 percent, with points increasing to 0.36 from 0.35 (including the origination fee) for 80 percent loan-to-value ratio (LTV) loans. The effective rate increased from last week. The average contract interest rate for 30-year fixed-rate mortgages with jumbo loan balances (greater than $424,100) decreased to 4.13 percent from 4.21 percent, with points increasing to 0.21 from 0.20 (including the origination fee) for 80 percent LTV loans. The effective rate decreased from last week. The average contract interest rate for 30-year fixed-rate mortgages backed by the FHA increased to 4.17 percent from 4.15 percent, with points increasing to 0.40 from 0.37 (including the origination fee) for 80 percent LTV loans. The effective rate increased from last week. The average contract interest rate for 15-year fixed-rate mortgages decreased to 3.65 percent from 3.66 percent, with points decreasing to 0.34 from 0.37 (including the origination fee) for 80 percent LTV loans. The effective rate decreased from last week. The average contract interest rate for 5/1 ARMs decreased to 3.40 percent from 3.56 percent, with points increasing to 0.73 from 0.46 (including the origination fee) for 80 percent LTV loans. The effective rate decreased from last week. The Mortgage Bankers Association predicts it will rise to 4.6 percent in 2018. The National Association of Realtors expects it be around 4.5 percent at the end of 2018. Realtor.com says the rate will average 4.6 percent and reach 5 percent by year-end. Though rates are likely to rise, there’s still a window for homeowners to refinance if they haven’t done so already. Lenders typically say it’s worth it to refinance if you can lower your rate by half of one percent. Home prices nationally increased year over year by 7 percent from November 2016 to November 2017, and on a month-over-month basis home prices increased by 1 percent in November 2017 compared with October 2017. 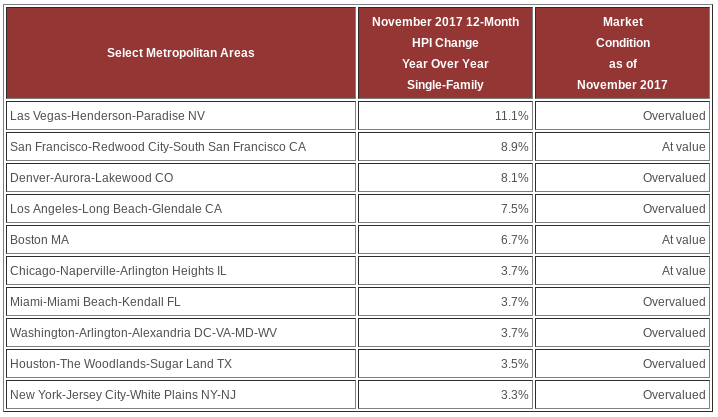 Looking ahead, the CoreLogic HPI Forecast indicates that home prices will increase by 4.2 percent on a year-over-year basis from November 2017 to November 2018, and on a month-over-month basis home prices are expected to decrease by 0.4 percent from November 2017 to December 2017. Washington, Nevada, Utah and Idaho posted 12-month price gains of 10 percent or more in November. Lack of affordable housing stock keeps home price index high in many markets. According to CoreLogic Market Condition Indicators (MCI) data, an analysis of housing values in the country’s 100 largest metropolitan areas based on housing stock, 37 percent of metropolitan areas have an overvalued housing stock as of November 2017. “Rising home prices are good news for home sellers, but add to the challenges that home buyers face,” said Dr. Frank Nothaft, chief economist for CoreLogic. “Without a significant surge in new building and affordable housing stock, the relatively high level of growth in home prices of recent years will continue in most markets,” said Frank Martell, president and CEO of CoreLogic.